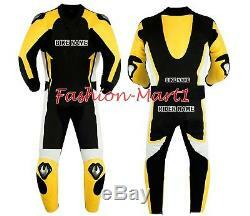 Original 1.4mm Cowhide New Leather Racing Suit Designed For Men & Women All Size Available. Designed For Professional Bikers With Higher Level Protection Accessories, Quality Is Guaranteed. Made of 100% genuine 1.2 1.3 mm cowhide leather. Polyester Mesh Lining with removable protector pockets. Original YKK zippers for durability. High Quality CE Certified Protectors in elbows, shoulders and back. High quality stretch fabric between under arms for comfort and. White, Black, Green, Red, Blue, Grey, Yellow, Orange, ETC. All Orders are manufactured freshly and we take almost 8 to 14 days to complete the production process according to the manufacturing schedule and queue. This design is also available for ladies and kids. This design can be changed as per customers demand. Patches/Labels and your own racing numbers are also available on demand. Also Available In Kangaroo Leather, The Kangaroo Leather Price is 70% High. Also we have ability to make the CUSTOM SIZE MEASUREMENTS. Custom NAME, LOGO and NUMBER. 1 piece / 2 piece option. Men's / Women perfect fitting. So we can talk with you thoroughly about all the measurements. Please make sure that you take your exact body measurements and do not leave extra inches loose (not to take too tight measurements also) as we will add extra inches ourselves if needed to maintain the suit shape in order to achieve an outstanding fitting, comfort , flexibility and being able to wear any under garments or other clothing. We also suggest you to take the measurements of the naked body or of slim clothes to get accurate measurements. Measurement form is attached along with the above pictures of the suit. You are kindly requested to fill the form with the instructions provided in the form and send it to us. All our parcels are sent with tracking numbers. We must be informed immediately after the receiving of the merchandise if any fault or defect is found on goods. Or the merchandise is not as per described. We are your one stop-platform that is easing your purchasing with standard and. According to the needs of the customers. 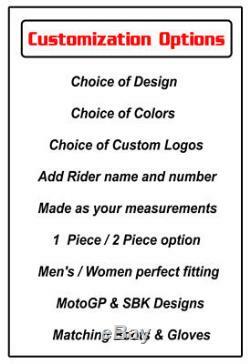 Including custom logos, labels, rider name and numbers. We will reply you soon. The item "BLACK YELLOW MOTORCYCLE LEATHER SUIT MEN RACING MOTORBIKE LEATHER JACKET TROUSER" is in sale since Friday, October 19, 2018. This item is in the category "Vehicle Parts & Accessories\Clothing, Helmets & Protection\Motorcycle Clothing\Riding Suits". The seller is "fashion-mart1" and is located in Sialkot. This item can be shipped worldwide.